Dr Tina Blaber-Wegg is a community musician and singing for health practitioner. 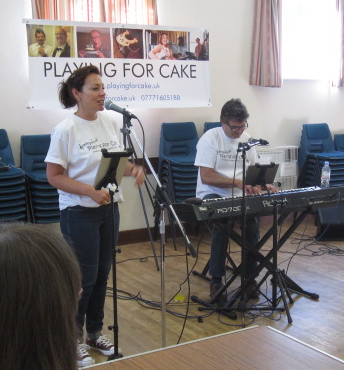 Tina is a Director and founder member of Playing for Cake (PFC). Through personal experiences, Tina realised how beneficial singing and music-making can be for improving health and wellbeing, for particular health conditions as well as general health. Tina studied with Access to Music in Norwich gaining her Performing Musician award in 2007 and has been a community musician since 2010, performing as a solo artist and as a band member of Cutting the Mustard. Tina played in PFC when it was a band, before it was set up as a community interest company and provider of music for health and wellbeing. Tina set up a community-based open mic session (The Jam Club) in Sheringham in 2011, providing a space for musicians to gain confidence in performing, learn and develop skills associated with their music-making and perform with/share their music with others. 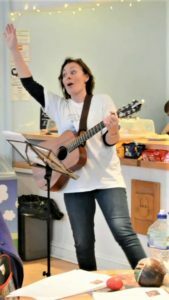 Tina worked as a singing tutor for Sing Your Heart Out (SYHO) (an organisation that organises workshops for people to sing together and gain the known benefits this can bring for mental health). Tina has volunteered with Musical Keys, which provides interactive music sessions for people with speical or additional needs across Norfolk and Alzheimer’s UK. Tina’s previous work experience in community development, at North Norfolk District Council, let to her interest in sustainable development and ultimately studying for a PhD in Environmental and Social Sciences at the University of East Anglia in 2016. Tina’s research developed her awareness of the important role health plays within aims for stable and sustainable communities. Tina is now keen for PFC to contribute to the social and environmental sustainability of the North Norfolk area through its support for residents’ health and wellbeing as well as the financial support it can provide to local musicians (and thus local arts in general) through their participation in the delivery of the sessions. Drawing funding into the area to enable opportunities and services to be on offer to local residents (that are available in other parts of the country) is part of the aims of PFC. Tina has completed Singing for Breathing/Lung Health training with the British Lung Foundation, Sing to Beat Parkinson’s training, Age UK Dementia Awareness Workshop and a Safeguarding Adults Awareness Course (delivered by St Thomas Training). 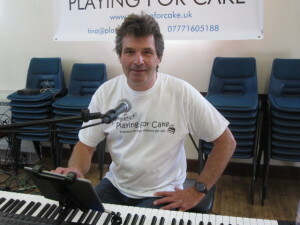 George Crawley, pianist and session leader. George plays at sessions and plays a significant role in our musical arrangements. George Crawley is an Executive Director of PFC and a core member of the delivery team of PFC alongside Tina. George has been playing in bands or as a solo performer for over 40 years, other activities has included Amateur Dramatics and even playing the organ in church! More recently George helped develop The Jam Club in Sheringham, regularly accompanying new artists who may lack confidence in performing in public. He has also gained experience of delivering interactive music sessions through those already performed over the last 2 years. Steve Wiles is a musician and has also had a variety of jobs, including bespoke furniture-making and running a local website. He has run craft workshops for people with learning difficulties and volunteered at Thornage Hall (a Camphill Community for adults with learning difficulties). Steve has been involved with bands for a long time covering music genres including soul, reggae and rockabilly. He was in a band called ‘The Press’ in 1978. 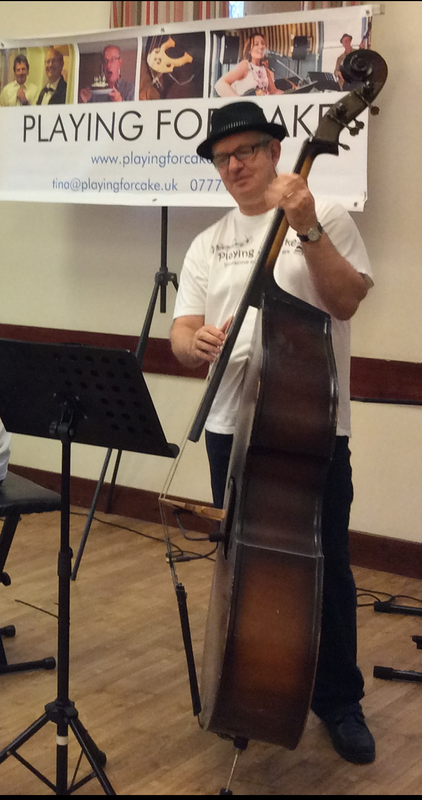 Steve has played electric bass, saxophone and the double-bass. Steve met Tina in 2011 and they decided to form a duo. Steve introduced George to the band in 2013 and came up with the name ‘Playing for Cake’ as they generally toured North Norfolk tea-shops, pubs and restaurants and often literally got paid in cake! Steve always stressed this ensured “we get paid in the right currency!”. Music is a huge part of Steve’s life and he has always encouraged people to participate in music-making in some way. He still maintains that the most important thing about playing music is to have fun. This is a major part of Playing for Cake’s ethos as it has been developed into the Community Interest Company that it has become today. Rebecca Culley joined us as a volunteer early in 2017 and is now going on to study Health and Social Care at ‘A’ Level at Sheringham Sixth Form. 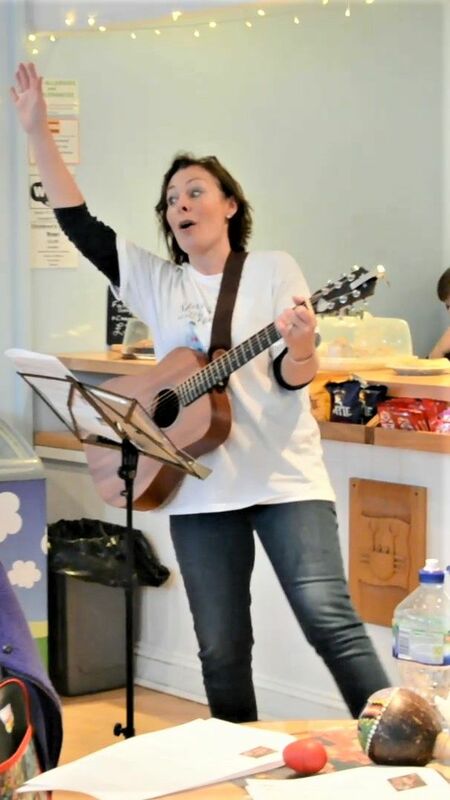 Rebecca will also be working with us part-time alongside her studies this year on our joint project with Sheringham Little Theatre ‘Mid-week singing and music-making at the Hub!’. We feel this work experience will be extremely beneficial in adding another dimension to her studies. Louise Lim, originally from Suffolk (but a Norfolk convert!) is a Speech and Language Therapist. 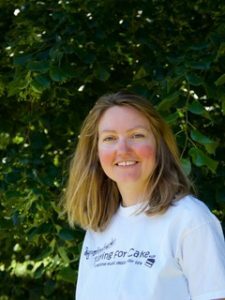 She has over ten years experience of working in various settings including NHS hospitals and clinics where she specialised in working with adults with neurological changes such as Parkinson’s, Stroke and MND. She spent 6 years working in neuroscientific research at University College London looking to understand speech and language recovery in stroke patients at a brain level. 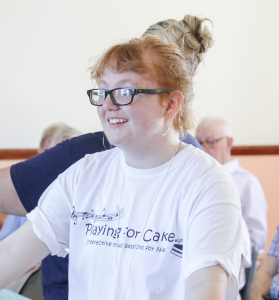 Louise is excited about the benefits of singing for people with speech, voice, language and communication needs, as well as the hugely positive affects of singing and music on wellbeing. Louise is based in Norwich where she is setting up ‘Recommunicate Speech’ – an independent Speech,Language and Communication Therapy Consultancy. Louise is currently learning to play the ukulele and leading on our North Walsham and Aylsham district Skylarks singing group! Ervin Munir MBCS CITP is a Director and a core member of the delivery team at PFC. He is also a local open mic committee member and organiser (Rock the Lobster). He sings and writes songs (www.ervinmusic.co.uk) and regularly plays guitar performing solo and with friends, at Rock the Lobster and other local venues in and around Sheringham. Ervin set up the Rock the Lobster record label and produced and mastered the Chilled Lobster 01 album (CD, iTunes, Amazon, Spotify etc.) of original songs, working with many local musicians in his home recording studio. More recently he worked with Tina and other local musicians to produce the PFC Sheringham By The Sea fund raising EP. He sings and plays guitar (and kazoo) in a popular local band called Cutting the Mustard alongside George (above), Tina (above) and Brian Eade (bio to follow – Brian is also a part of the PFC delivery team!). In his delivery work with PFC, and in helping to run Rock the Lobster, Ervin has learnt how powerful music, singing and performing can be to a person’s well-being. Elizabeth (Liz) Housden, a music teacher from Fakenham, has also joined our team recently. Liz is taking the Fakenham and district Skylarks singing group. More information about Liz (and a photo!) will be posted here soon! Lyn Wiles is a drama teacher (working in a number of schools local to North Norfolk) and a musician – a singer who has performed in local bands for many years. Lyn helped get Playing for Cake off the ground. Lyn’s experience of creating and delivering drama sessions and interactive music sessions over the years is a major asset to the team, providing creative ideas for our sessions and advice for the team. Jane Wells is a composer and community musician and helped set up Playing for Cake intially. She studied music at university to postgraduate level in the 1970s and since has led creative music making projects with many and varied community groups alongside continuing to compose and attract performances of her work. She was a founder member of the community music organisation, Norfolk Music Works, which ran successfully for 20 years serving West and North Norfolk. She is a well established singing tutor for Sing Your Heart Out, an organisation that supports mental health through singing. She completed a Dementia Awareness Workshop run by Age UK in March 2016. Jane is therefore an important advisor to the delivery team a required. We are currently recruiting! See our News or Help Us pages for more information.